Not dealing with our emotions and our resentments will have detrimental effects on our physical, mental, and emotional health. Use the Forgive Quick Response Tool (FQR) to find immediate relief from pain and hurt. You can keep your sense of justice while simultaneously removing the sting that comes with holding on to a negative emotion. Press on with a clear heart and mind! 1. Identify the Feeling You Are Holding - "I am angry right now!" 2. Welcome it / Observe & Witness it - "Well look at you all fired up!" 3. Ask the Question - "Do I want to be WITHOUT this feeling just for now?" 4. Choose - If NO, go back to Step 1 and allow the feeling to come. If YES, continue with the FQR Tool. Place a lightly closed fist right above your heart. Verbalize each statement below. As you do, lightly thump chest once and take one deep, extended breath after each statement. Thump chest lightly and anchor the feeling by visualizing it settling into you. Really allow the new feeling to settle in. Repeat if necessary until you feel a positive shift in your emotions. 1. What did I replace the negative feeling with? 2. What is this person or situation teaching me to do for myself? 3. What is the gift I have now received? A One Day Workshop to Find Your Freedom Again. Is It Time to Forgive and Find Peace? 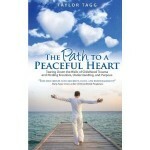 #1 Amazon Best Seller The Path to a Peaceful Heart Get your copy now! Taylor's first book on how to stay positive in a negative world. Inspiring Interviews Now Playing on Journey to Success Radio! I know Taylor Tagg to be a man of integrity, insight, and generosity. He has the skill of listening deeply, and the art of using your words to open a window on your soul. He has made it his mission in life to bring peace and joy into the lives of those he meets, and I, for one, have benefited from that mission often. You have been an amazing accountability partner that has willingly invested your time supporting my needs. You are good at hearing what is being said and provide constructive feedback on what is needed. You have been reliable and consistent in being fully present when we meet. You are thoughtful and offer suggests that have moved me forward. I am grateful to you and for your support. I have had the greatest thing happen to me in the past month of my 48 years of life. 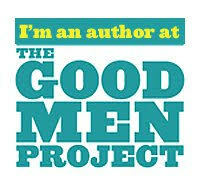 I have forgiven the things that have hurt me in the past, through my Forgiveness Coach Taylor Tagg. Until I spoke to Taylor a few months back, I never even knew that I needed his help in overcoming the things that were stopping me from moving forward, especially with relationships in my life. I can tell you that I now feel more peaceful, happy, my joy has returned, my laughter is constant, and my emotional pain has been released. Taylor walked me through the whole process….It worked! I am observing that after letting go of resentments and grudges my life energy has become more available to me every day now that I have let go of the bitterness. It’s a much more joyful existence. This is such important work. You would not believe how great the payoff I feel is. My wish is that everyone experience this. The world would be such a better place. I have more clarity and I don’t have confusion anymore, as it enabled me to see I was not the root cause of the problem. I forgave that person, forgave myself, and I replaced my negative feelings with feelings of love and hope and mercy. Just allowing forgiveness to enter into my life is totally positive in itself. I learned that forgiveness was only for me. I never even thought of doing forgiveness work before, now that I have experienced this I am so excited at the freedom I feel. This past year I lost three great friends, and now Forgiveness has helped me with my grief process. Finally, I feel at peace with their deaths. Working through my issues has made me feel rejuvenated. I highly recommend this to everyone. It is total freeing of the soul, mind and body. Taylor, I sincerely want to say THANK YOU, for this transformative change in me, and to my life. I will always keep you in my prayers, words cannot express my appreciation of you…it’s like I have a new life all over again. You and this process have exceeded my expectations. An Engaging Way to Start Your Day - The Evolving Heart | Let Go | Forgive | Overcome Defeat | Build a Solid Foundation | Become the Most Successful Version of You | Steps to Success | Lead the Field with Heart | The Evolving Heart | Let Go | Forgive | Ove on An Easy Way to Feel Good Now! 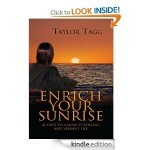 Taylor Tagg on An Easy Way to Feel Good Now!